Bases, bases, bases! Lots of bases! Few weeks ago I’ve ordered a handful of resin bases from Micro Art Studio and finally later last week I’ve received my package! I’m happy as a small boy. Finally most of my miniatures will have proper bases. Of course, right now it’s going to be loads of work with pining and glueing minis to the bases (not to mention painting them), but I can assume it’s going to be fun work:). And what’s more important it will be very rewarding – everything I was doing for past few months (or even years now) will be finally finish… I just need some time:). This game is something totally new for me. Some kind of uncharted territory. I have no clue how to play Wolsung ( XIX century Fantasy Steampunk Skirmish Game) yet, but what’s more important for me the models from Wolsung are absolutely awesome! I adore the Victorian style of the faction I chose for the start – secret club of noble men and women of The city of Lyonesse – Ash and Oak. All was needed to complete my starter were the bases. When I looked trough the offer of Micro Art Studio, I noticed there’s only one choice for Wolsung miniatures. 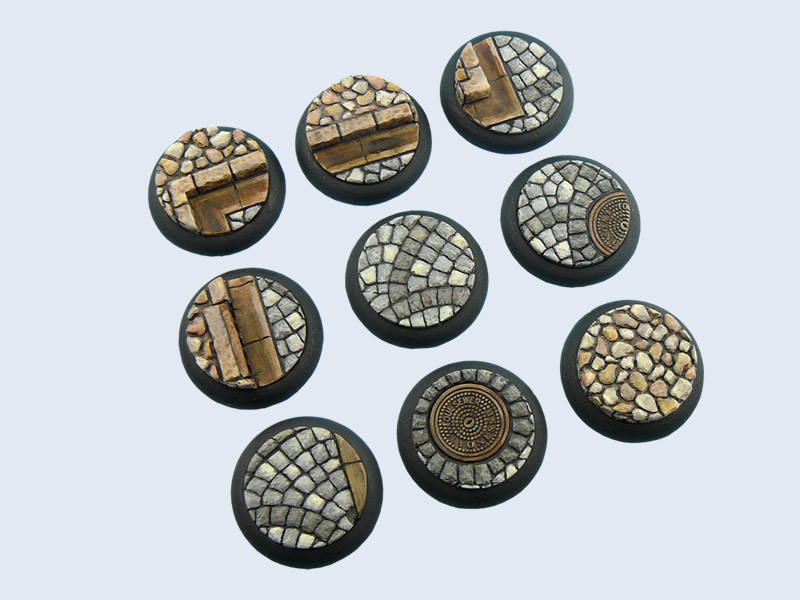 Cobblestone bases (lip round – Wolsung use those). That’s the streets of Lyonesse spirit! There’s even Lyonesse city sign on the entrance to the sewers. Like I wrote – no other choice. And it is so much easier to base the whole faction – it’s around 10 miniatures (nothing like my Skaven army – around 100…). That’s the beauty of skirmish games like Wolsung – only few models to take care. This will be my next (after Blood Angels) great Warhammer 40k project. Totally Slaanesh army, mostly Daemons (with maybe one detachment of Noise Marines led by Lucius The Eternal) – no other gods. Right now, even though I have most of the miniatures for my starter army – I’m not planning to paint any of Daemonettes at the moment. Too much other stuff to paint in upcoming weeks – I’m forced to postpone mono Slaanesh army. The bases for Slaanesh could be tricky as you can imagine – there’s a plenty of possibilities – wastelands, lava, old chaos temples, but one design particularly have caught my attention – Possessed Bases. Not sure what exactly should be represented on those bases – but it looks demonic, hellish and very, very Slaanesh. Purple creatures trapped in the floor. Just perfect! With Slaanesh I had few other concerns – should I base the models on square or round. Or maybe pin them in such way to easily re-attach them and base on different base to switch easly between WH40k and WHFB. I can say – this is one of the reason also, why I’m reschedule Slaanesh Army for later – still I haven’t decided… I ordered Round Possessed Bases for now, but I don’t say no to square bases. We will see – eventually I’ll make up my mind (or maybe simply I’ll stick to new Age of Sigmar rules – and stay only with round bases. Oh, well, decisions, decisions, decisions…). Edit: One of my followers pointed me out that round bases are the same size as square Chaos Daemon size. That makes thing easier – I just put all round based Daemonettes to the moving tray and they are ready for WHFB experience:) thanks a lot, Azazel! Recently I have bought several Infinity miniatures from Bakunin. I literally fell in love with miniatures. The sculpts are amazing and I can’t wait to paint them all (they have to wait in line though :), but meantime I’m going to study the rules, watch tutorials and battle reports and get few lessons from more experienced players. I need to train before I play serious game. 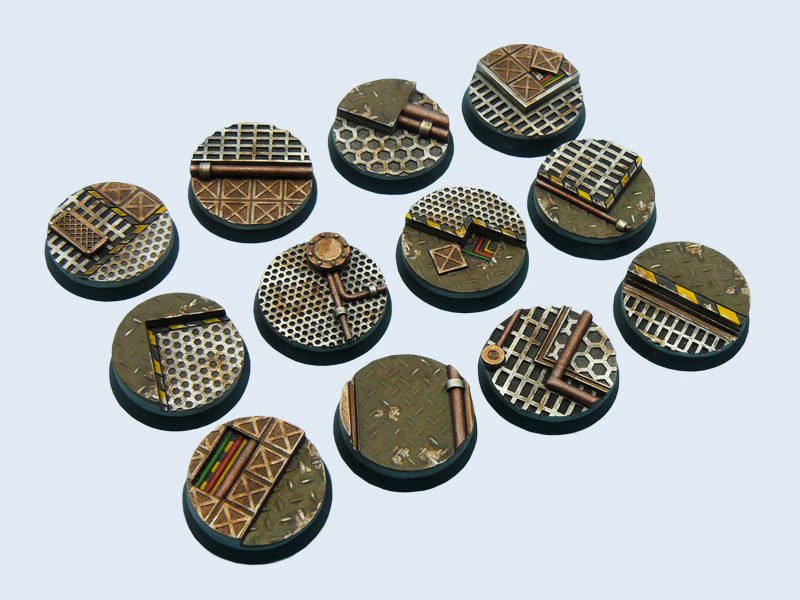 Nothing stops me from planning ahead though, so that’s why I decided to go with these awesome Urban bases. 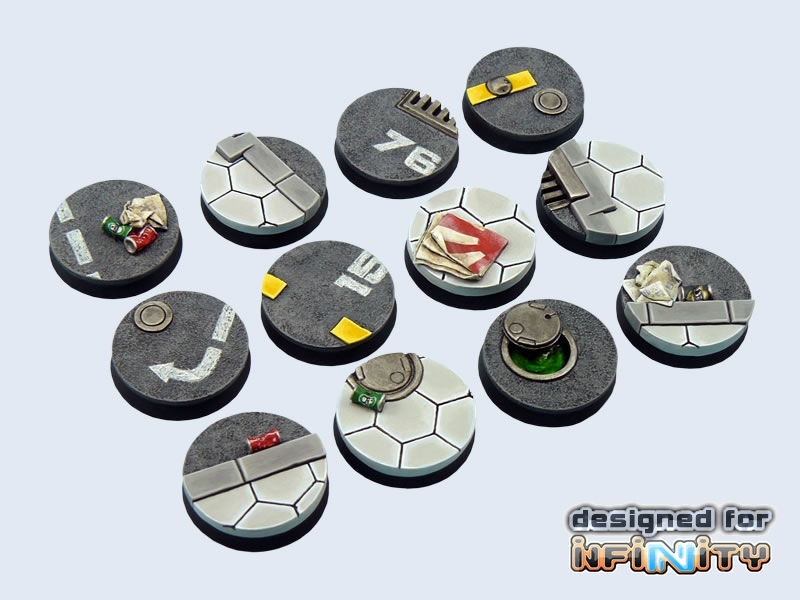 They suit perfect for Infinity’s SF style – most of the game mats and tables are set up in cities, so these bases will fit just fine. Maybe I should think about something else like Urban Fight Bases (kind of the same design but more like a warzone), due to the fact I collect Nomads, but hey, that’s my collection and I’ll stick with these. Micro Art Studio makes also many other products designed especially for Infinity – game mats, pieces of scenery, and even those bases have the Infinity signature. After All they are official partner or Corvus Belli – producer of Infinity Game. So, lots of bases as you can see and with fresh Fantascape bases for my Skaven, I must say I’m super happy right now. Wolsung’s Ash and Oak, Blood Angels, Nomads from Infinity and Slaanesh are ready to be proper painted and play with. Great! Every base in my big package is super detailed, made from high quality resin – you can spot very few flaws in the cast. Almost no bubbles, so green stuff is not necessary to fill them up. I’m super satisfied – soon some pictures of models with these super duper bases:). Micro Art Studio has more in their offer – what caught my attention beside my purchases – Jungle bases for my Lizardmen – these is won’t be painted in near future, so I gave up on those bases for the moment. Next time. All Micro Art Studio products can be ordered from their official store or from Wayland Games, UK based affiliate partner shop of Game of Travel. Later this week (or next) I’ll post few pictures of my Wolsung Skirmish Game models with bases and hopefully right after that some Blood Angels. I must say I never had full army painted (I think I mentioned that before), but also I never had adequate bases for any model in my army. Soon everything will change! …ah, and today I ordered tripod, light box and lamp to make better pictures for the blog. Hopefully quality of content here will improve soon. PS. All photos are taken from Micro Art Studio webpage and I did not make the painting job. Nice bases. 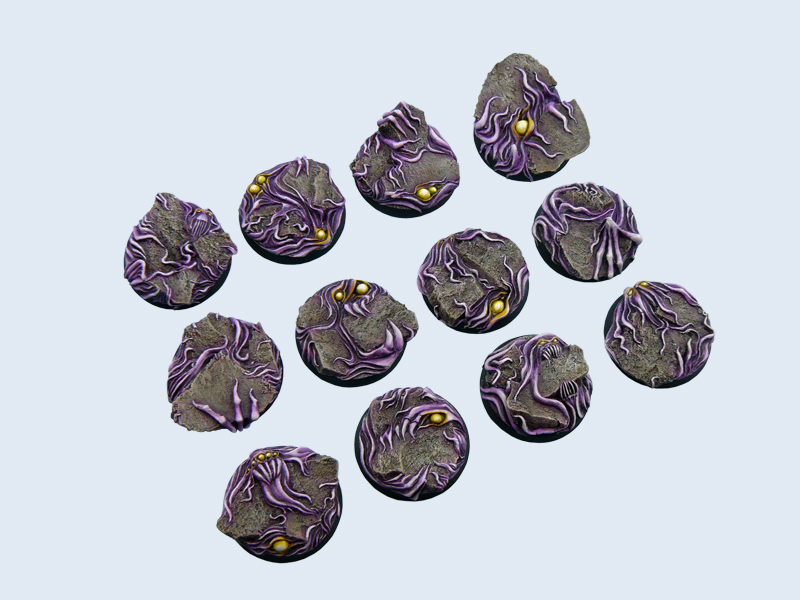 If you’re using movement trays for WHFB and want to keep your models versatile for Fantasy and 40k, you can base your Slaanesh Daemons on the 25mm rounds, since they use 25mm squares anyway. Yes, that is true although it does require quite a bit of converting of movement trays. The War of the Ring trays are nog entirely right for Warhammer. On the other hand: Warhammer Fantasy is now also on round bases. Micro Art does make soms great bases. I bought quite a few for my wifes Beastmen, and also have soms for my 40k stuff. Tim, I love Micro Art bases – I get some more from them for sure – maybe Chaos wastes for more Daemons (Khorne in the future), and of course Jungle for Lizardmen! That’s quite a grab bag of bases. Very nice!